I had a very full day yesterday, traveling two hours to Gifu City where my friend Masashi Kutsuwa teaches furniture-making in a program run by Gifu Prefecture. 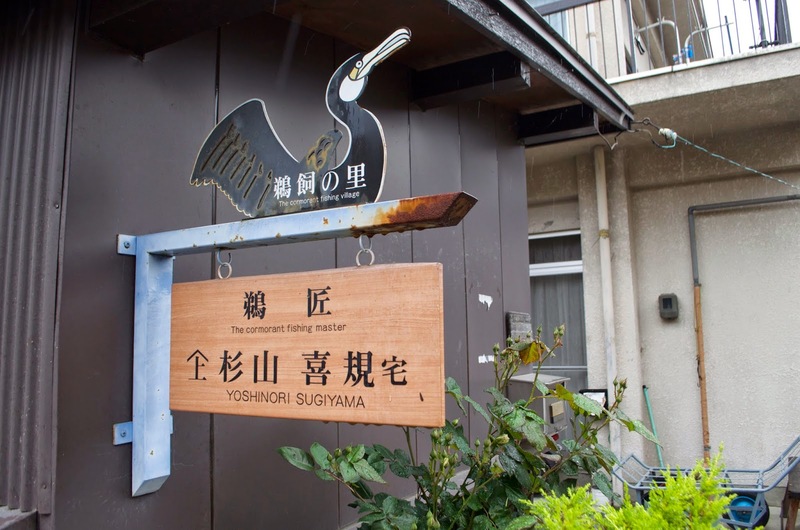 He's been very interested in the culture of cormorant fishing, which is the major tourist attraction in Gifu City. 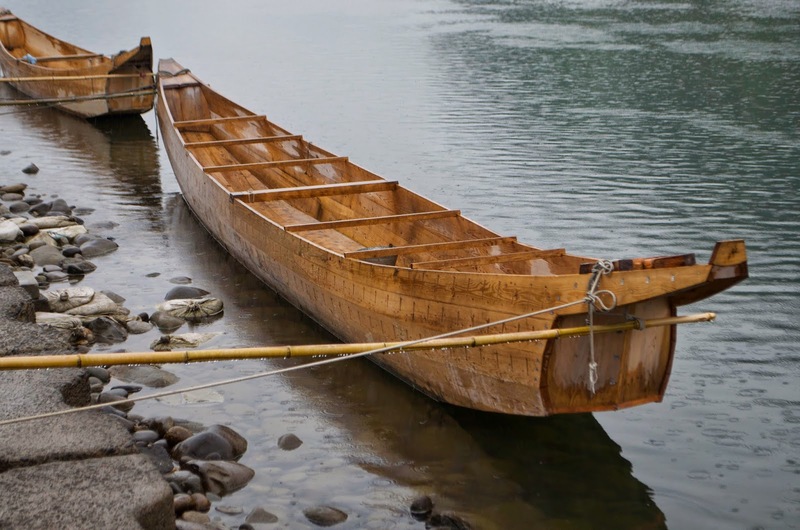 He has taken students and studied the basketry used by the fishermen (used to carry their cormorants), and the boats. 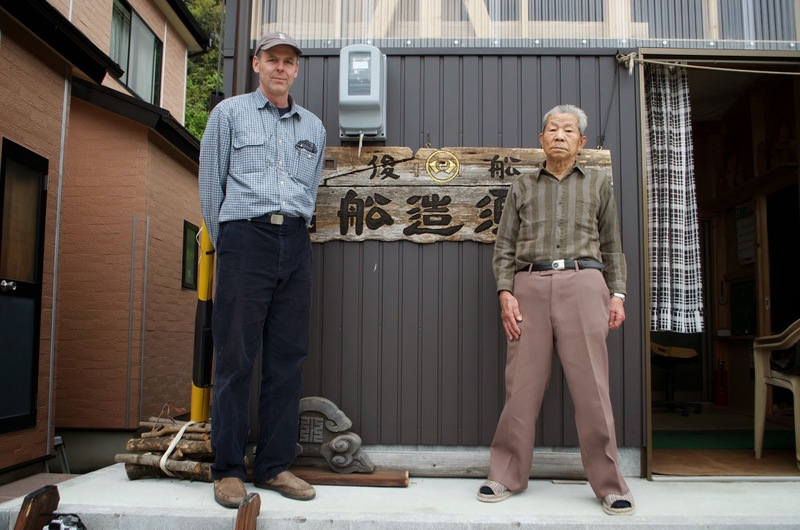 Years ago I met Mr. Seichi Nasu, the last builder of cormorant boats. Since that first meeting I've gone back to see him several times. 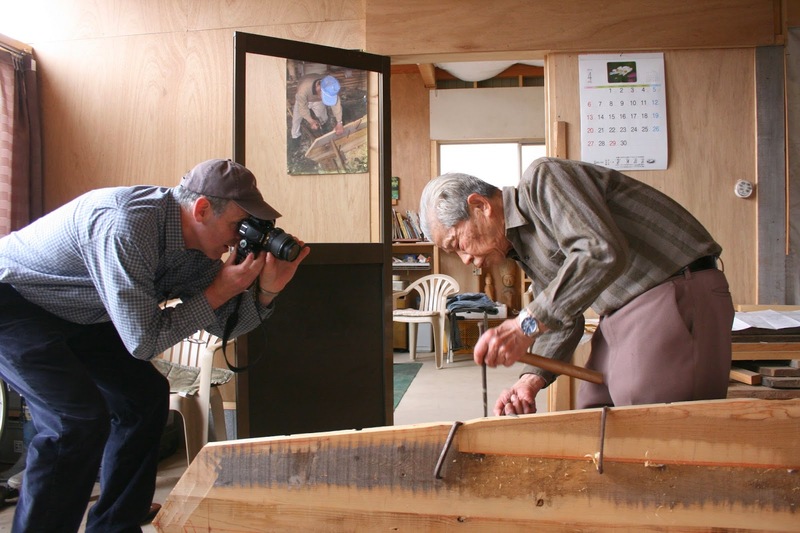 He had an apprentice many years ago, a man who then turned to making wooden bathtubs and buckets, but who has recently gone back to boatbuilding, especially since Nasu san, at eighty-two, has become too old to build the large fishing boats. If you don't feel like reading everything here, you should at least consider scrolling down and seeing the video links I've posted. 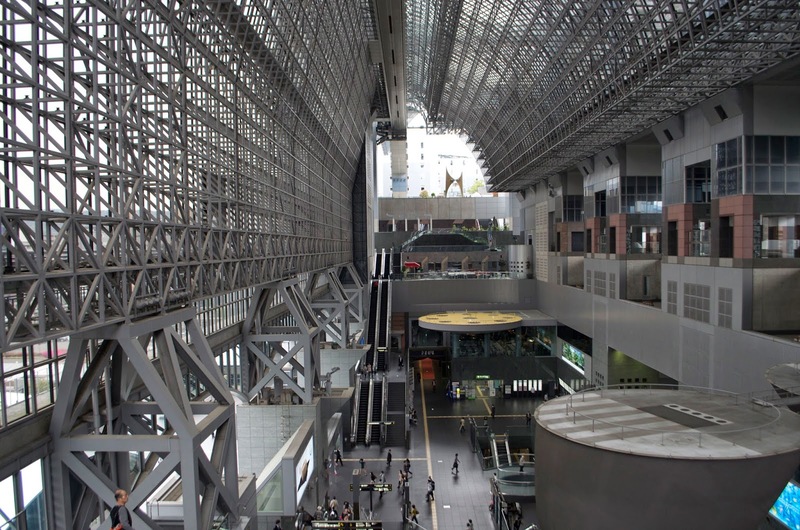 I passed through Kyoto Station on my way to Gifu, which is in the mountains on the banks of the Nagara River. 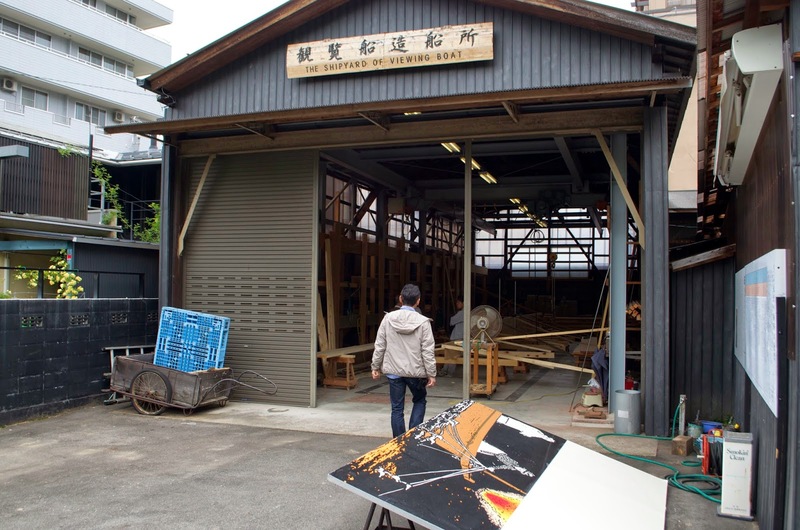 Our first stop was the Gifu City boatbuilding workshop. Here the city has three boatbuilders making the tourist boats that watch the fishermen work. They had just started a new boat and had the bottom set up for assembly. 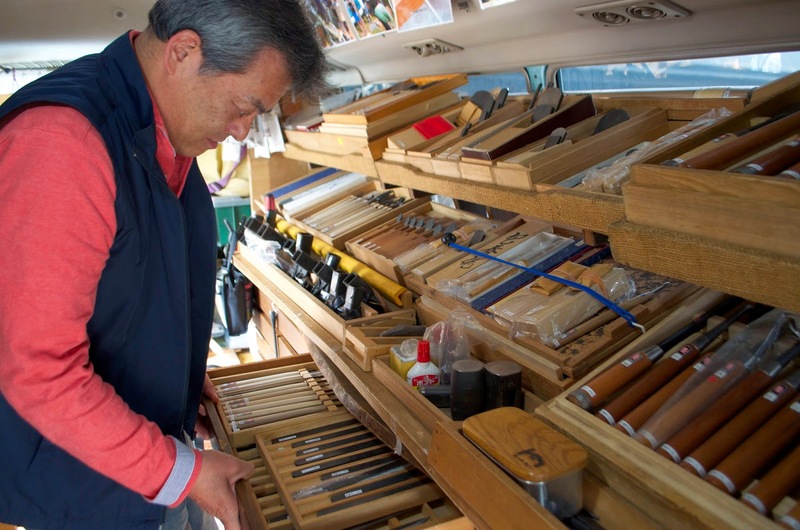 Nails have become a real problem for boatbuilders across Japan. 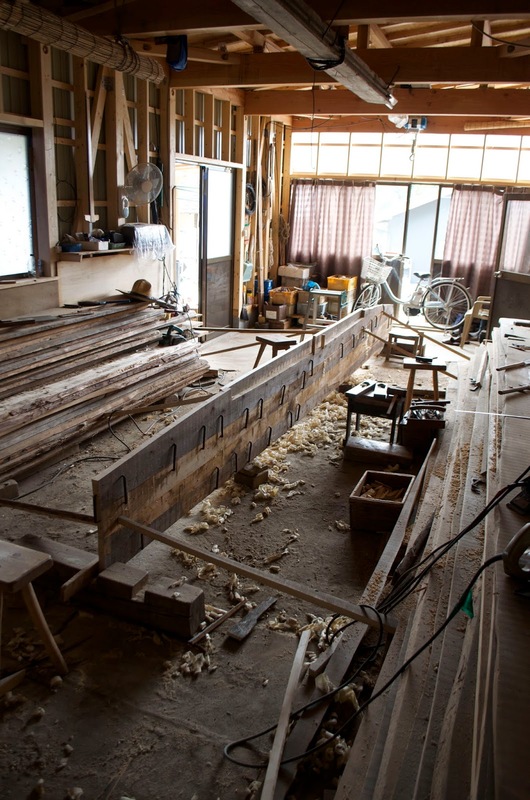 Traditionally in the Gifu region they used a nail with an angled head, but now there are no sources for these nails and the boatbuilders I met yesterday have all taken to pulling them out of derelict boats. 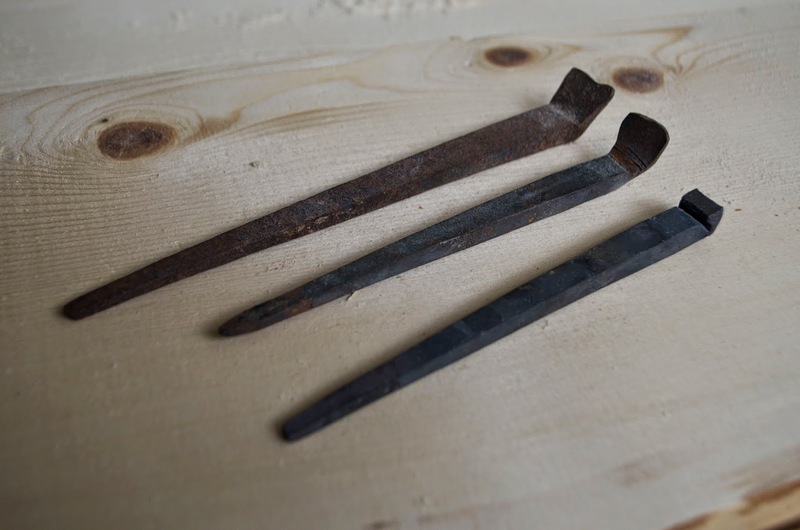 The new nails have squarer shanks and come from temple carpentry. 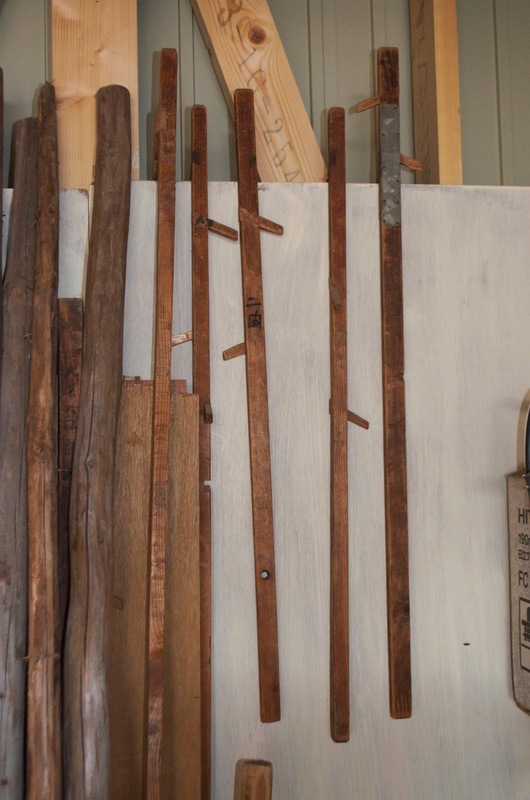 Boatbuilders use a very interesting tool to set plank angles, but the city boatshop had a novel take on the old idea. 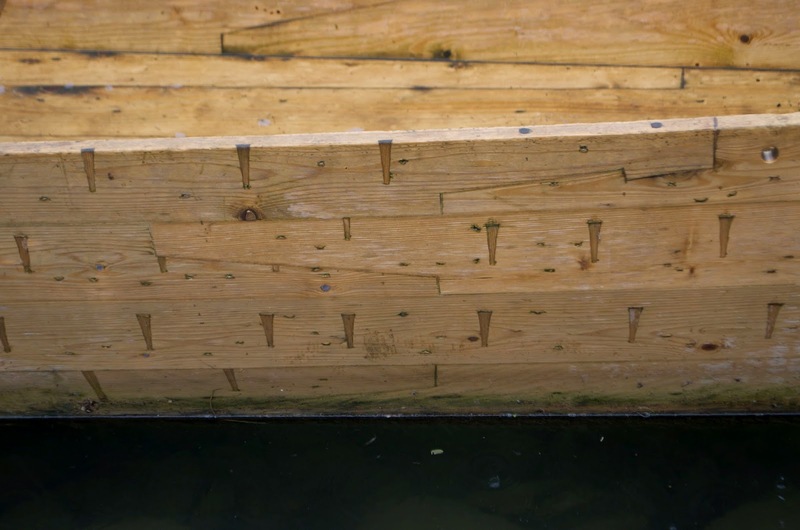 A piece of plastic mounted on the wooden bar had hash marks for the proper angle of various planks. Below I show the traditional version. Here is the fleet which contains the boats the tourists ride on (large and small) as well as a boat containing a men's and women's bathroom, several rescue boats, and in the foreground an actually uakibune, or cormorant fishing boat. Some of the large, white boats were fiberglass, but most of these boats are wood. 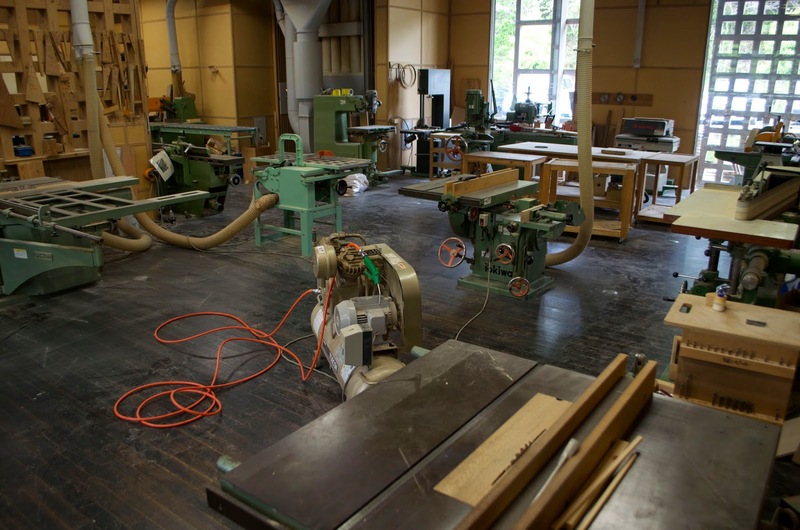 A segue here to the furniture school, which enrolls about twenty students in their two-year program. Tuition is about $5,000 a year with students living in the community. When I showed up the visiting tool salesman had just arrived, with his large customized van outfitted as a rolling tool store. 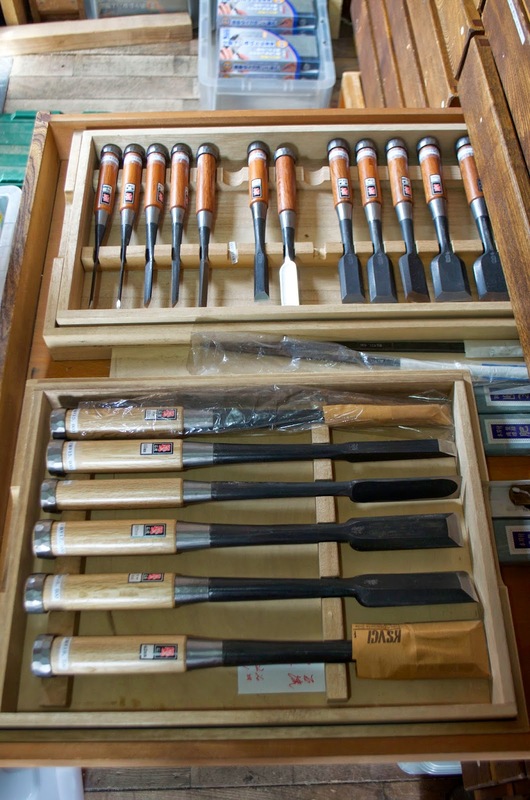 These very high quality tools at matching prices. The lovely inklines were made by a retired temple carpenter. I loved the drum-like hammer, but at $250 I figured I could leave it on the shelf. 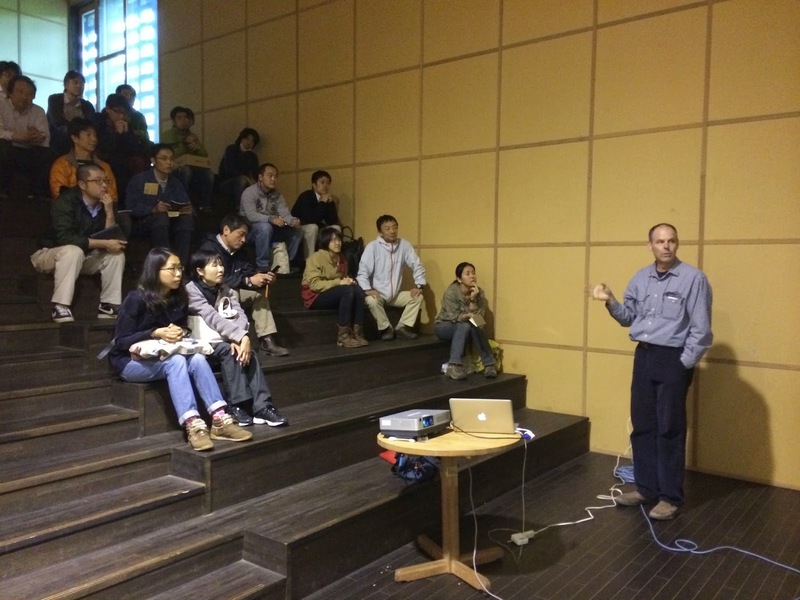 I lectured to the first-year students that evening. 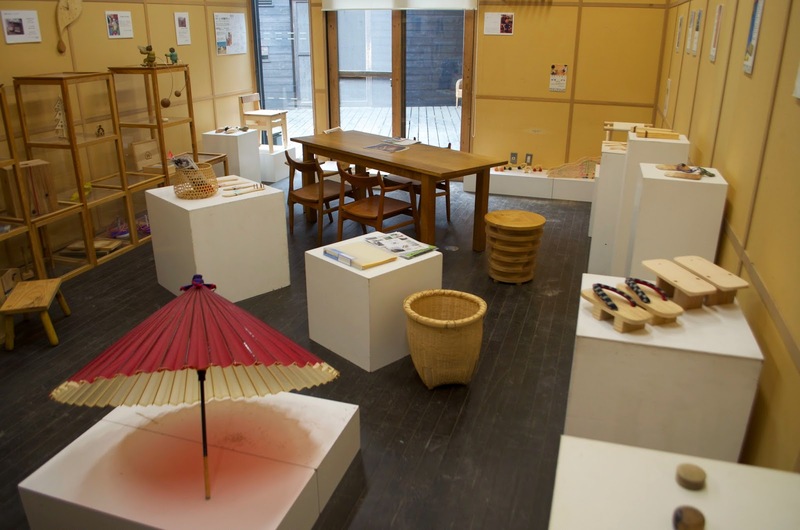 The program is trying to encourage students to develop wooden products based on local traditions and needs. 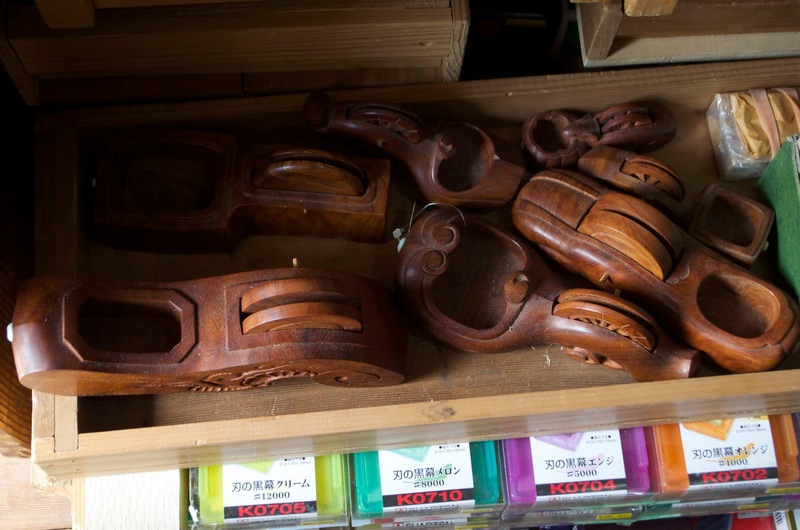 One of last year's graduates is now making geta, or wooden sandals. 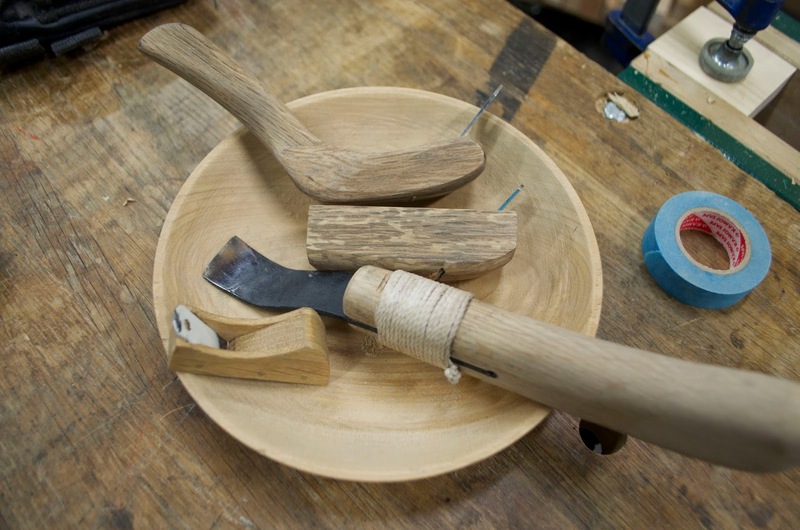 The shot above was a project were all the students made very small carving chisels and planes and each had to make a bowl with them. Then it was upriver to Nasu san's shop. 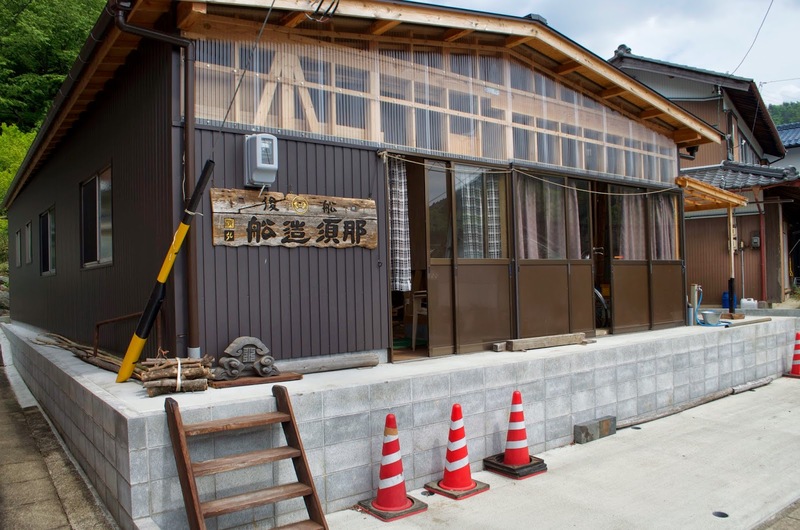 His former shop was close to the river and the government decided to concretize the river bank, so he built a new shop further uphill. I liked the fact that he demanded the traditional clay floor in his work area. 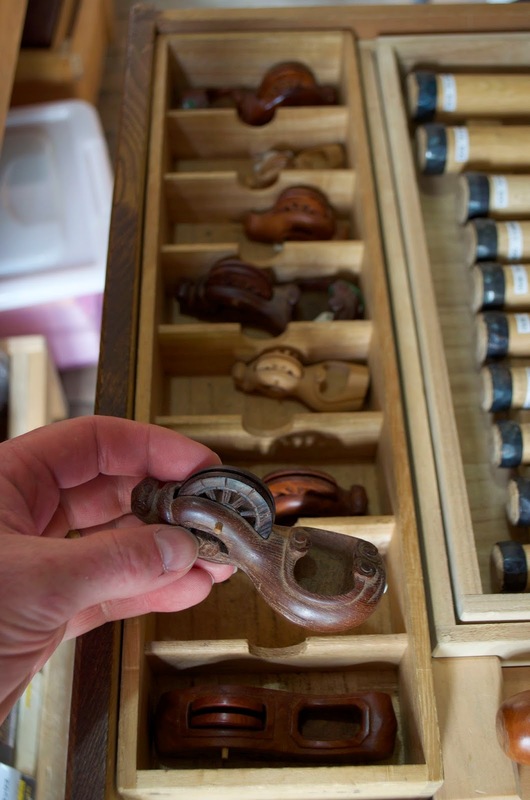 He told me he had taken to carving models of his boats to try and work out designs. Surprisingly crude but he insisted it had been a worthwhile exercise. 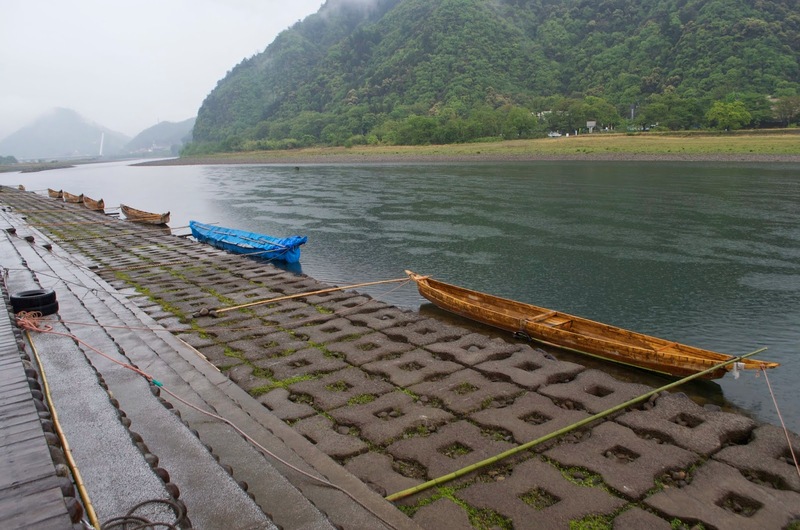 These patterns are Nasu's record of plank angles. 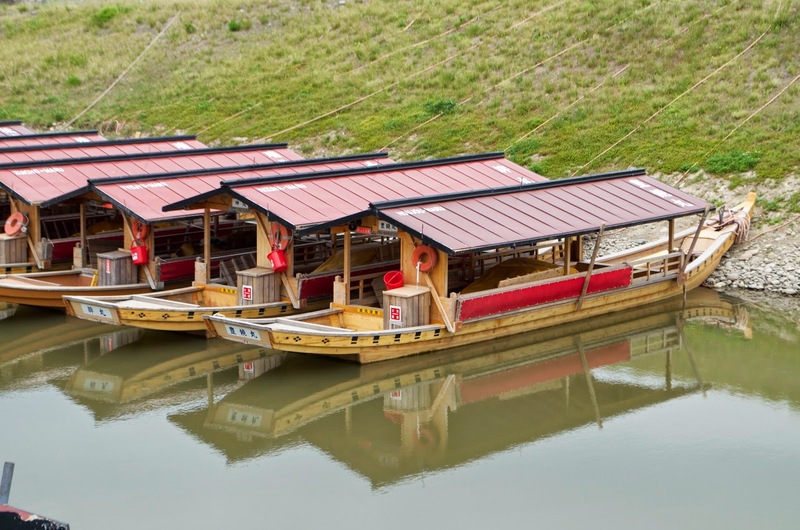 Like all river boat builders I have met in Japan, Nasu has never used drawings. All dimensions are memorized. 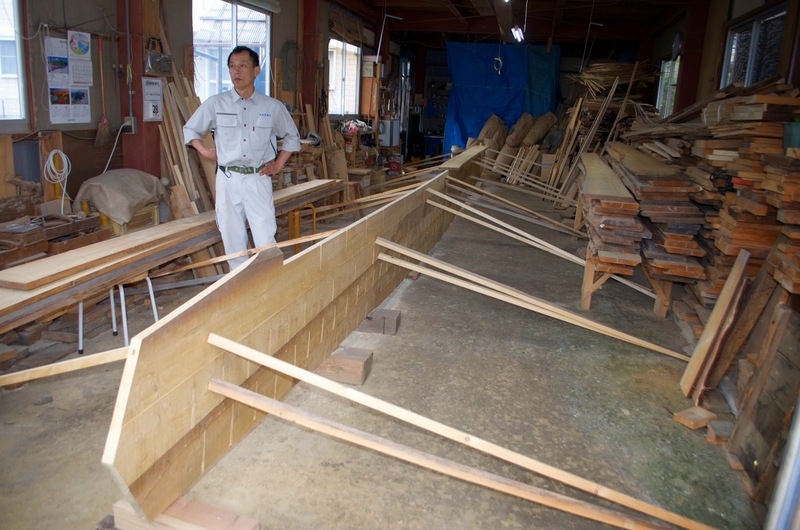 Nasu san is currently building a small boat for ayu fishing. 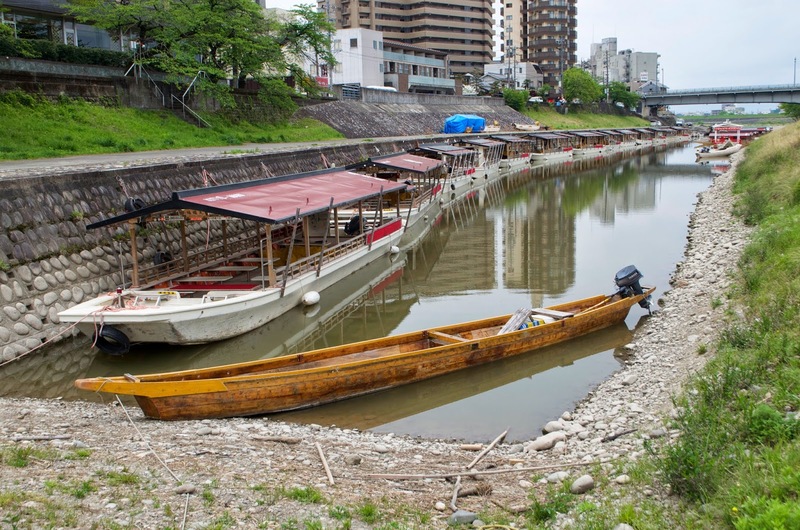 I am building the same type of boat here in Kameoka, though the two boats look very different. 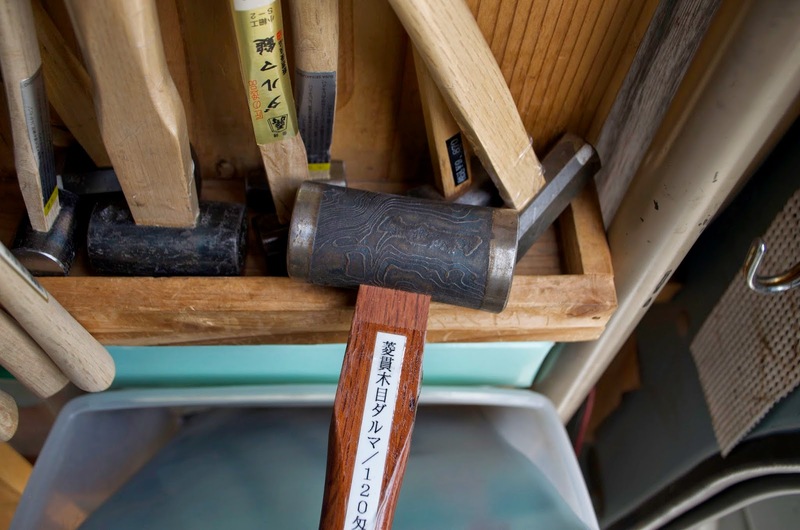 I have included two videos here of Nasu san using the momojiri and then driving a nail. The latter is incredibly entertaining, a technique I have seen other boatbuilders use. 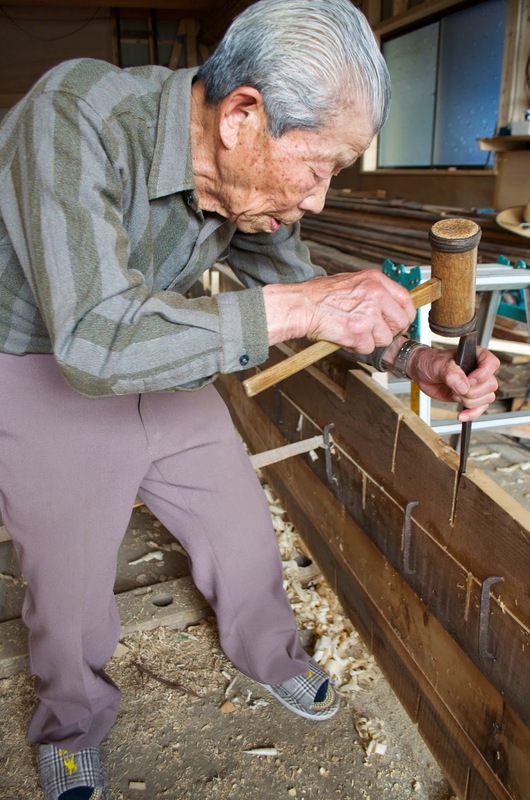 Nasu san insists its vital to have a feel for how the nail is driving, because the planking is so thin. I am convinced there was just an element of fun in this, something to lighten the work in the shop. This technique is called "uguisu no tani watari," or the "bush warbler flits across the valley." A poetic name for an intriguing technique. My friend found another video showing some Tokyo candy-makers doing a similar thing. 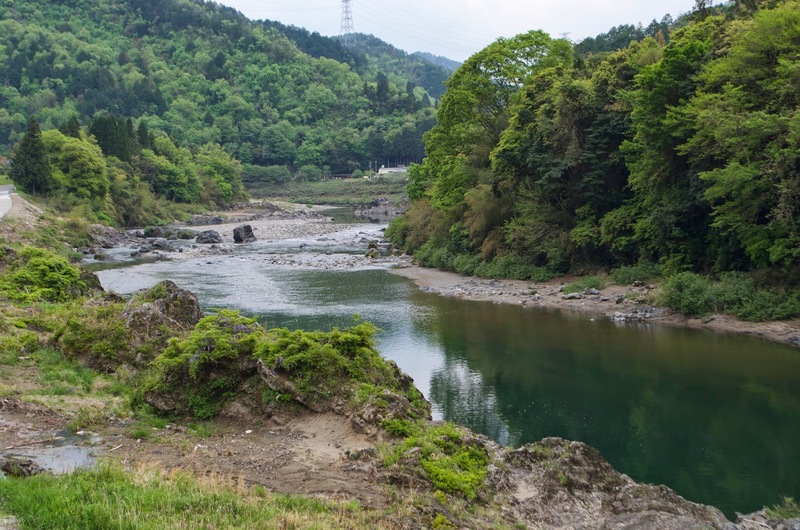 The Nagara River in front of Nasu san's house and shop. 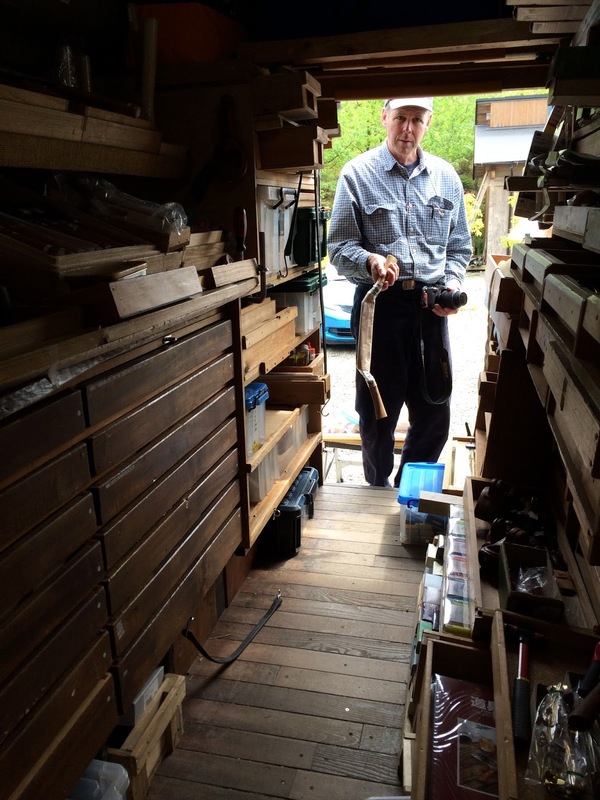 From Nasu san's shop we went to Gujou City to see his apprentice, Tajiri san. 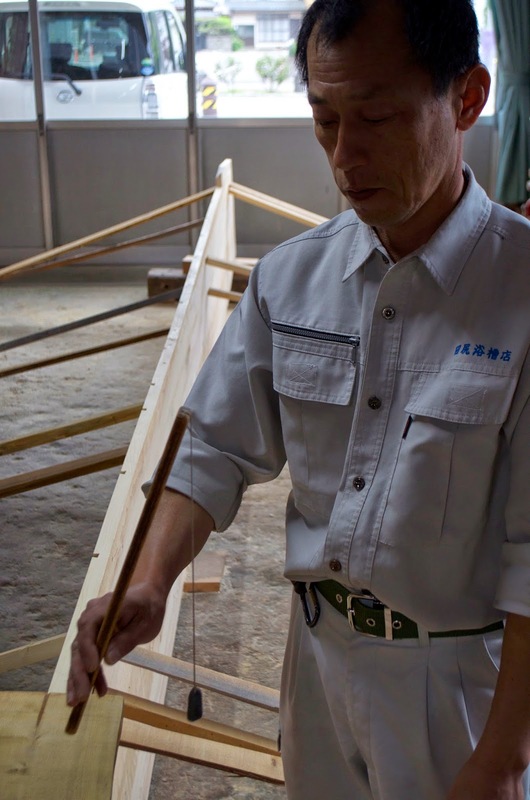 He is 52 and now building a new ukaibune fishing boat. 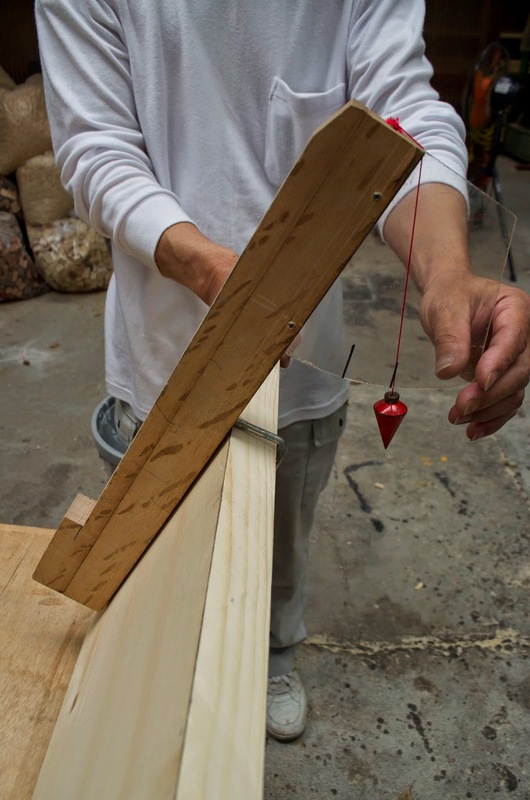 He showed us the traditional tool for setting plank angles. 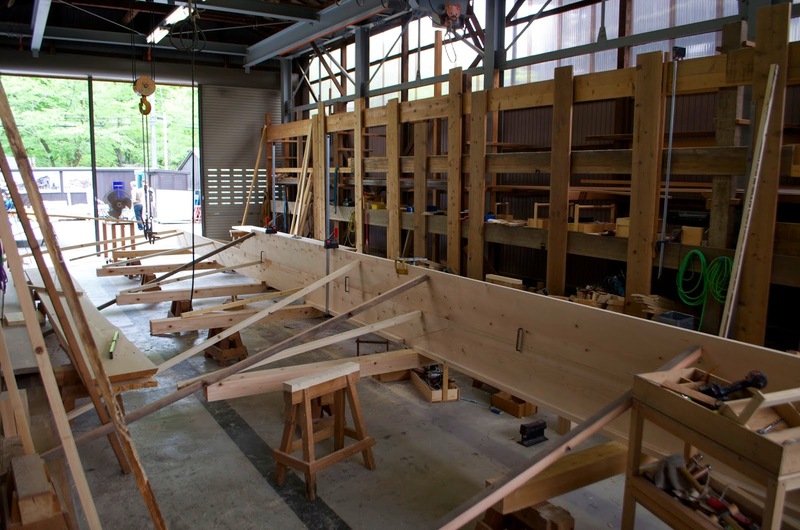 The boatbuilder simply remembers the horizontal measurement from the line to the stick for each angle. 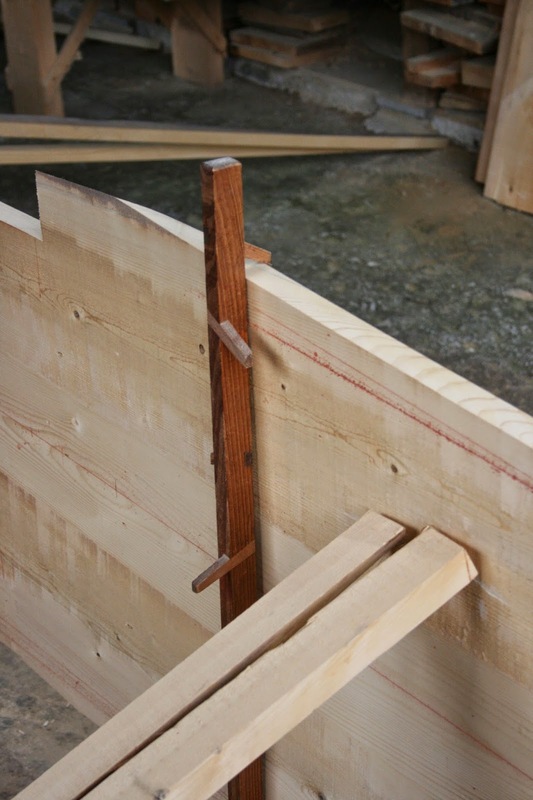 This pattern is also used to set plank bevels. Tajiri san learned this technique from Nasu san. 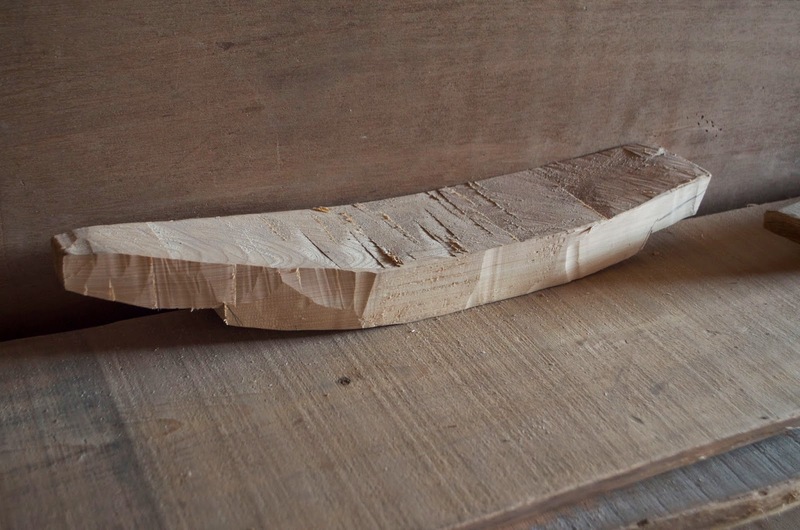 This bottom planking is almost 35 feet long, but amazingly just over an inch thick. Tajiri san told me he makes the bottom with a slight curve, but that water pressure will flatten the bottom. He also said the boat will be flexible and this is safer. The fishermen work standing up and the boats are incredibly narrow for their length. A flexible boat is less apt to capsize. I stayed overnight with my friend and this morning we took a look across the river where the six usho (cormorant fishermen) live and keep their fishing boats. 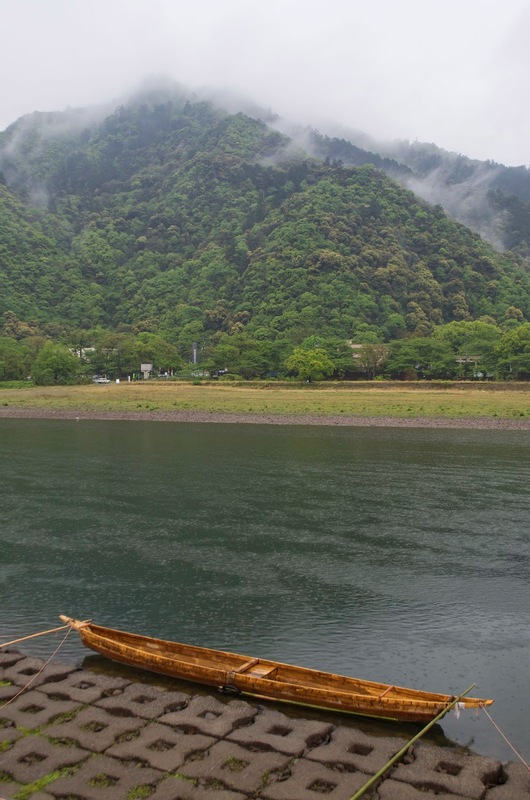 This is an inherited position and technically Gifu's six fishermen are employees of the Imperial Household Agency that administers the royal family. 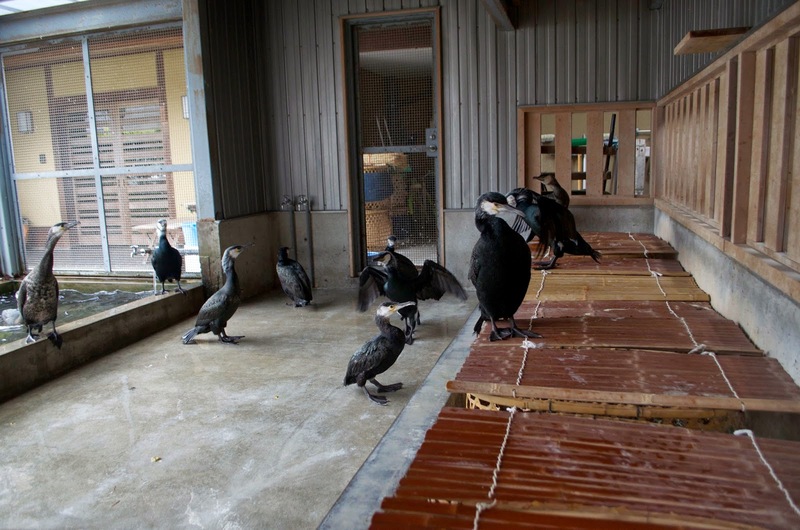 The cormorants live with their owners. They work for ten years and are retired, but kept by their owners until they die a natural death. 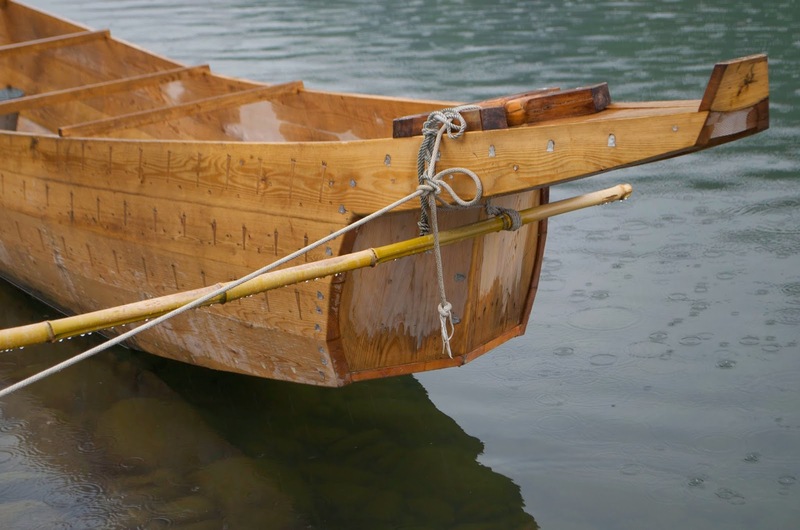 Cormorant boats have a distinctive foredeck and stern deck. The fishing is done at night and the boats carry charcoal lanterns to attract the fish (ayu). The birds wear brass rings around their necks to prevent them from swallowing the larger fish. 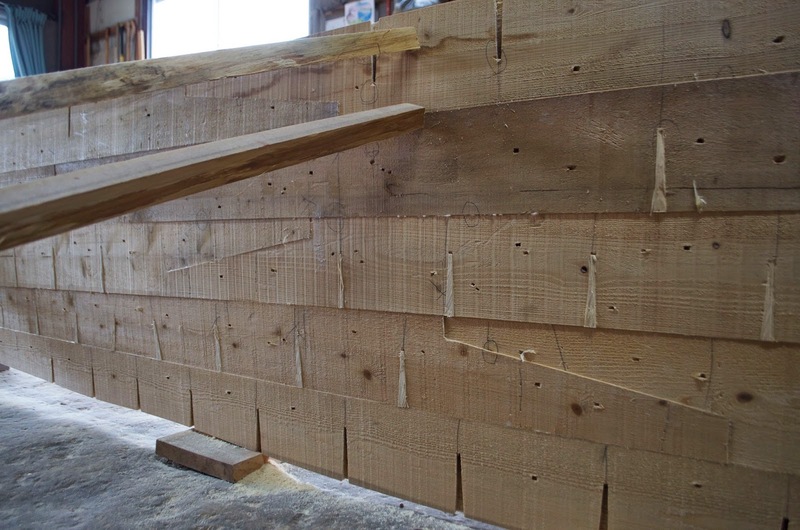 Scarf joints in the planking. This is wonderful, beautiful pictures. Thanks for sharing.